We offer several lines of wood burning fireplaces to meet just about any need. Hearthstone Stoves are made by people who take great pride in their work. Each and every Hearthstone stove is hand crafted to the highest standards. The materials used are the finest, strongest and most durable available. We combine time-tested craftsmanship and materials with the latest heating technology to ensure our stoves are clean-burning and efficient. 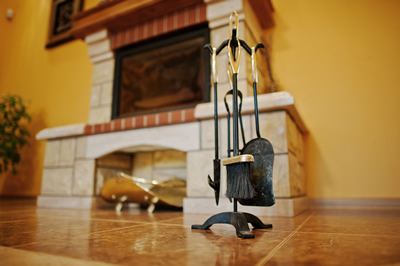 There will always be pros and cons of how a wood burning fireplace compares to a gas fireplace. It all boils down to the personal needs and desires of the homeowner. If you are a person that enjoys the ambiance of dancing yellow flames and a warm cozy look and feel, then a Kozy Heat wood burning fireplace may be ideal. Wood inserts are a great way to turn most open masonry or manufactured fireplaces into efficient heat sources for small, medium and large homes. If your fireplace is worn or damaged, no worries. 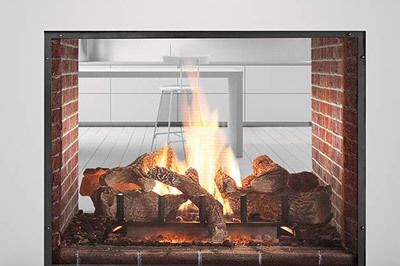 A wood insert is self-contained and will fit into most existing fireplaces. Choose from any of the designs from any of the manufacturers below! Stylish, efficient, and durable, our gas fireplaces are designed to compliment your home decor and some are engineered to meet your home heating needs. 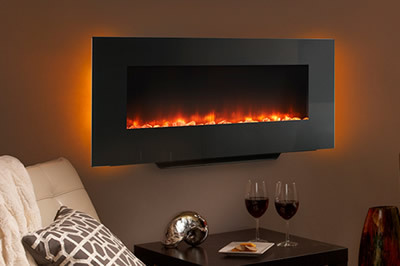 Our gas fireplaces come in many styles and sizes. Choose unique brick interiors, fans, electronic ignition and remote controls to make your gas fireplace fit into your lifestyle. Our gas fireplaces use outdoor air for combustion, which improves your indoor air quality and maximizes the heating of your home. Quality, style, durability and performance are just a few words that describe our direct vent gas inserts. Choose unique fronts to compliment your decor and taste. Our gas inserts come with a powerful built-in blower, highly detailed ceramic logs and embers. We offer small to large inserts that will fit your fireplace for the perfect view of a beautiful fire. 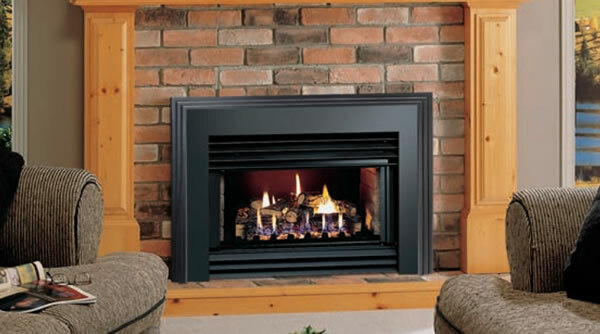 We carry vent-free gas fireplaces, gas stoves and gas logs. A good fit for older homes, large rooms or those areas of your home where installing a chimney or vent just isn't possible. Our vent free appliances are 99.9% steady state efficient. Customize your unit with blowers, trim, decorative louvres and cast iron surrounds. For vent-free stoves, choose unique fronts and colors; and for vent-free logs, choose a glass door to match your decor and protect yourself against cold drafts. These are a great choice for an apartment, condominium or house. One look and you may swear it looks like a real fire. No gas line or venting required! Most models are available with 110 or 220 volt heaters. They are available without the heater option, as well. A choice of designer fronts, doors, trims, refractory panels and remotes make it easy to customize your electric fireplace or insert. Choose a traditional fireplace look with a wood cabinet or build your own. There are many sizes to choose from – just plug it in and enjoy! Redefine your outdoor space with a fireplace! You'll be able to enjoy your outdoor area year-round with the comfort of a unique modern fireplace from HMI. 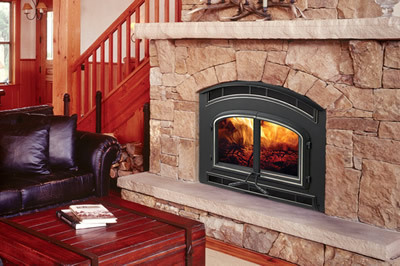 Transform your drafty wood-burning fireplace into an efficient, green heating powerhouse with a pellet fireplace insert. 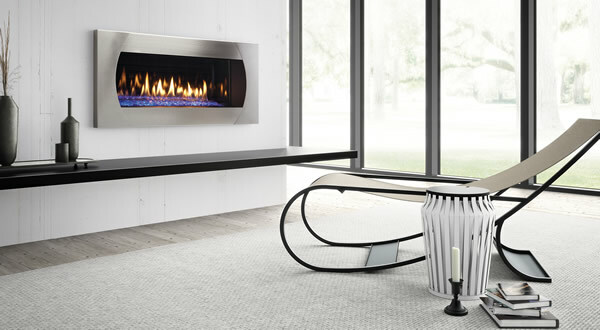 Pellet fireplace inserts feature long-lasting performance, providing a clean and consistent heat. They are also easy to use and maintain. Beauty, warmth and atmosphere that will never turn to ashes, that's what you will get with our Hargrove Gas Logs. A Hargrove gas log set is a great way to turn an ordinary fireplace into the focal point of your room. Every Hargrove log is molded from actual wood and finished with up to six hand-painted colors to create the most realistic gas log set in the industry. Every Hargrove Gas Log Set can use either natural gas or propane and is backed by a lifetime warranty.